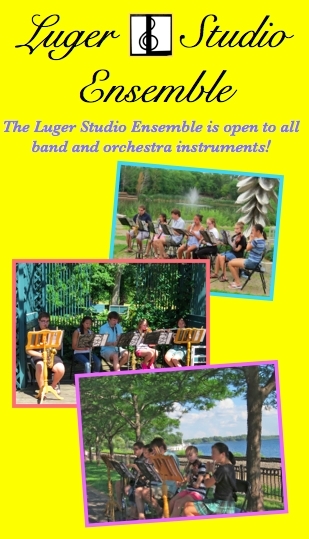 Mark Luger, director, student chamber ensemble for school band and orchestral students. Chamber ensemble for students - a unique opportunity! Learn new, exciting pieces along with other students gr. 6-11 who are really into classical music! Exceptions will be made for younger students who are sufficiently advanced. You do not need to be taking music lessons from me to participate. You are not required to attend every single rehearsal and are not charged for unattended rehearsals. We meet usually every week on weekends. It is $20 per session (pay by session). If one sibling is in it, another can be in it for only $10 ! I provide all the music, free of charge. We rehearse in Wayzata and Minnetonka. We have a wide variety of parts to play; very easy to very challenging. Students can help choose pieces they want to play! I arrange all the parts (I also compose music), so I can tailor a part to each student's ability. I've composed or arranged several pieces as solos for different members of the group with the ensemble as accompaniment. We mostly focus on classical music, but we also perform pieces like Gershwin's "Summertime" and Webber's "Music of the Night". We perform in concerts throughout the year! You don't have to commit to it, if you just want to try it out. For more information on exact rehearsal times and rehearsal locations, please contact me. It's like being in a year-round honor band! In the summer we often have our practices outdoors in the Post Office Park across from my studio in Wayzata.